The Southminster Ringers, Santa and the Train kept children of all ages entertained on this great shopping day at The Village. Ringing from 11 – 1 was fun and festive! 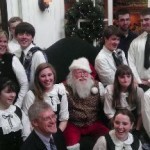 Santa and the Ringers.